This Vacation rental is truly "Between Waters". 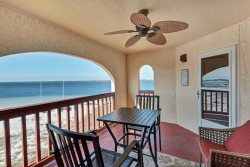 Sunset Harbour Villas 211 is a clean, newly upgraded, 2 bedroom 2 bath condominium located on the Santa Rosa Sound side of Navarre Beach, with only a quick walk to the emerald waters of the Gulf of Mexico. Accommodations include a queen size bed in the master bedroom and two twin beds in the guest bedroom. This cute condo has all the comforts of home and offers a fully equipped kitchen, a stackable washer and dryer, a flat screen TV in the living room and is steps away from the community swimming pool. This is the perfect place to relax and to create memories with your family that will last a lifetime! Love Navarre Beach, this was my third year in a row to come, plan on coming every year. We enjoyed staying at SHV 211 it was great!! Everyone I spoke with, especially Sarah was great! Sarah was the worker who finally got us the iron within 30 minutes of calling when we needed to iron our clothes for pictures with a professional photographer. Thank you Sarah for saving the day! It's a beautiful property, just needs a few things fixed and curtains added! They were very friendly and made check in very easy. Over all it was really nice. We had an amazing family vacation. The condo was toddler friendly and I wasn't worried about keeping him away from certain areas. Everyone was very helpful from my first e-mail asking questions to the day we arrived with all the e-mails informing us of stores and places to eat and things to do. Friendly, helpful, earnest, and caring. A great team in the office and on site. A clean, well supplied, comfortable and stylish accommodation that has me thinking retirement property (which is very soon) to buy. Close to the beach, with amenities. Loved it.